Grogmobile: First group of figures done! Did you paint these yourself? 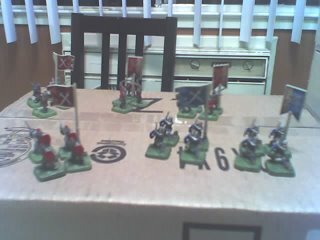 not very well focused :( is it Warhammer Fantasy Battles? Yah, camera phone not so good at closeups. Ohh BattleLore looks like fun. I love the WWII version of the game. Have you played much yet? What other games do you like? I absolutely love "Shadows over Camelot." Its great even for non-gamer types. Sadly the painting project has dragged on, so I haven't been able to play as much as I'd like! I haven't even gotten to the advanced rules campaigns. I haven't played Memoir '44, but I have played Battle Cry (Borg's Civil War game, the first in the series), which is a lot of fun. I think BattleLore is a better game, though I'm more interested in Civil War history than 100 Years War. Camelot I have but I haven't gotten it to the table yet! Sad, I know. Glad to hear it's a good one, though.